From El Salvador to Tanzania, smallholder coffee farmers like Dora and Gerard are improving the quality of their coffee and investing in a better future for their families. Each year, people around the world consume more than 400 billion cups of coffee, and the vast majority of that coffee is grown by the world’s 25 million smallholder coffee farmers. For National Coffee Day, we want to share the story of two farmers who are using coffee to provide a better future for their families. Dora Brizuela, a single mother of four, has improved productivity and resilience on her small farm by using better farming practices. 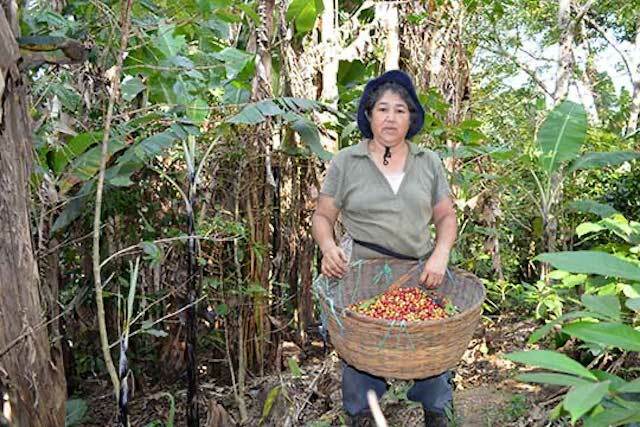 For Dora Brizuela, coffee farming has been a way to start anew in her hometown of Potrerillos de la Laguna, El Salvador. Dora was orphaned as a child there and eventually migrated to a city, where she slowly worked her way up from waitress to the owner of a small restaurant. After a 2001 earthquake left the region devastated, Dora decided to make a change: using the money she had saved and inherited, she purchased a 0.7-hectare farm in her hometown. Coffee farming in Central America is difficult, however. Farmers face fluctuating prices, and because many coffee trees in the region are old and poorly tended to, the risk of catastrophic crop diseases is always present. A leaf rust epidemic that hit the region in 2012 and 2013, for example, caused more than $1 billion of losses. 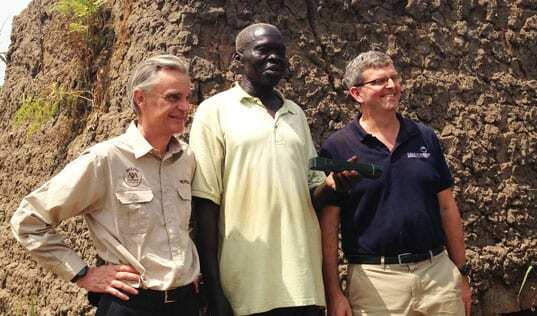 The Better Coffee Harvest Project – a partnership between TechnoServe, the U.S. Agency for International Development, the J.M. Smucker Company and the PIMCO Foundation – is working to make coffee farms in El Salvador and Nicaragua more productive and resilient. More than 8,500 farmers in the two countries have received training on good agricultural techniques. The project is also helping nurseries to increase the availability of high-quality seedlings for farmers to plant, and it is working with financial institutions and exporters to offer the credit that farmers need to buy those seedlings and other inputs. So far, farmers have accessed nearly $497,000 in loans. Dora Brizuela is one of the project’s most enthusiastic participants. The single mother of four offered part of her land to use as a demonstration plot, where she and 27 other members of her training can see the impact of good farming techniques on the coffee trees. The training has given Dora an ambitious goal: “I want to replant my entire farm in three years,” she said. 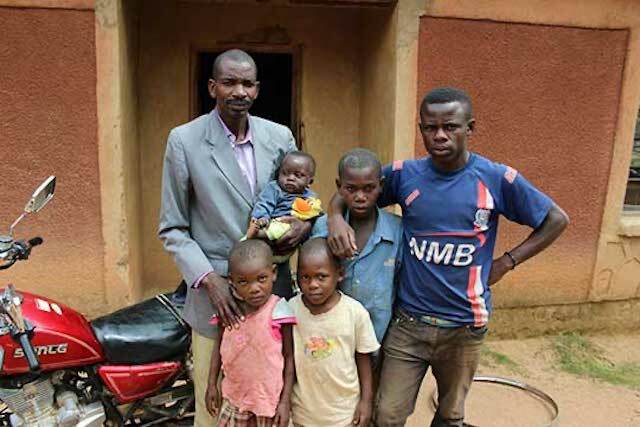 Gerard Simon Kumburu poses with his children. Thanks to his increased coffee income, he was able to pay for their school expenses. “The main challenges I faced were paying for my children’s school fees… Sometimes my children would be sent home from school because of not paying,” Gerard Simon Kumburu recalled. 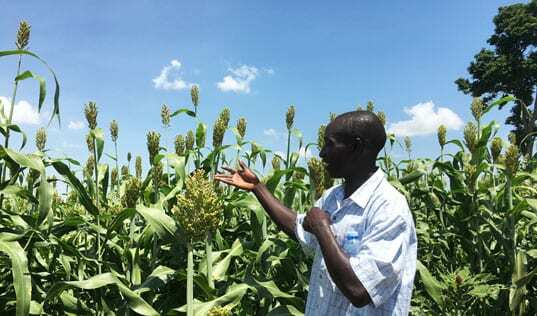 The problem was that his coffee farm in Tanzania’s Mbinga region did not earn him much of a profit: low productivity and low prices meant that he earned less than $600 per year from his farm. 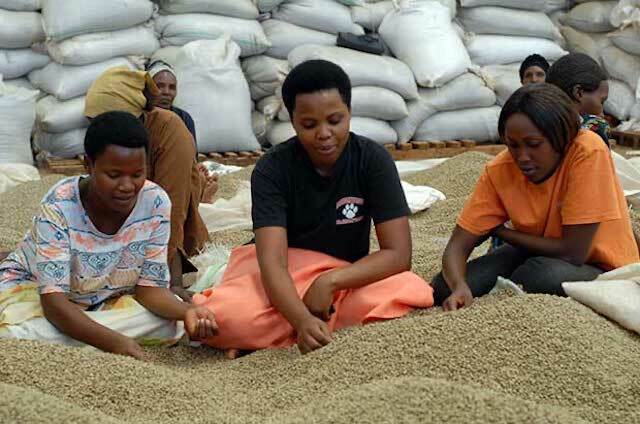 That began to change in 2008, however, with support from the Coffee Initiative – a project funded by the Bill & Melinda Gates Foundation and implemented by TechnoServe that improved the livelihoods of more than a quarter-million coffee farmers across East Africa. With support from TechnoServe advisors, the farmers in Gerard’s village formed a business group and constructed a wet mill to process their coffee, yielding a higher quality product that would earn them better prices. The farmers also began to receive training on farming techniques adapted to their community’s poor soils. Gerard took the lessons to heart. His productivity has increased dramatically, and in 2015, he earned $1,500 from his coffee farm. This extra income has impacted his family in a number of ways, but none more more significantly than in education: “I have cleared my debts with my children’s school fees, and can now afford to pay for their school in advance,” Gerard said. View more stories and insights in the Coffee Initiative report.